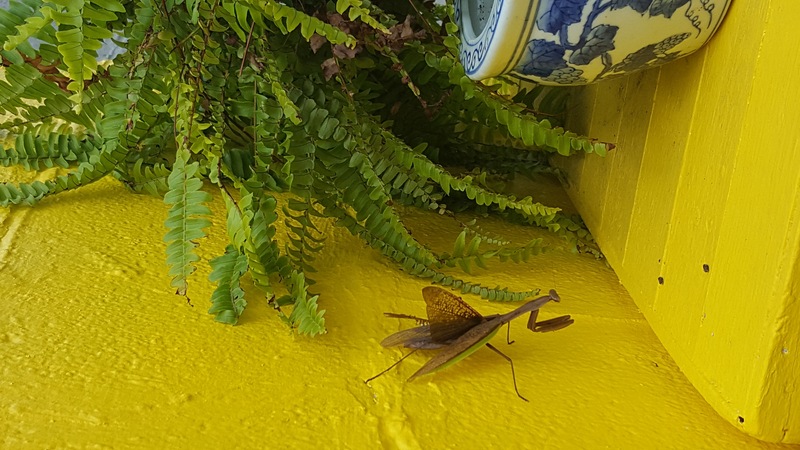 Two weeks ago I noticed this enormous insect at the entrance of Fafa, then this week he hung out around the fern at the yellow triangle door. Finally looked up to find it was a Praying Mantis, mantis means prophet in Greek. Here’s some info I’ve compiled about our visitor while he stayed for a time. If you know anything about the praying mantis, it will come as no shock that this insect is the paramount spiritual symbol of stillness and patience. The praying mantis takes its time in all that it does. It takes care to pay diligent attention to its surroundings, and moving through life at its own pace. It serves as a reminder for humans to slow down in our chaotic, fast-paced lives. The praying mantis also teaches us how to still our bodies and go within our own mind. By doing this, we can connect with ourselves, drawing up greater physical, mental, emotional, and spiritual power. This stillness and concentration is a form of meditation, a practice that the mantis places much importance in. Wisdom emerges when we are still and quiet, sensing and feeling rather than thinking critically. It comes with experience, age, and being, rather than traditional schooling. It cannot be obtained through arrogance. The praying mantis meaning has a variety of traits: temperance, quietness, awareness, calmness, clairvoyance, patience, mindfulness and innovation. These insects are well known for their pre-strike pose, which is a popular symbol of balance and patience in and of itself. In fact, the Chinese honor the praying mantis for its elegant, mindful, and contemplative movements. By reminding ourselves to have patience with ourselves in our own movement, we, like the mantis, can grow in our wisdom. They remind us to have patience in acquiring the things we want and to remain balanced throughout the duration of the wait. If a praying mantis strikes too soon, its prey gets away. Because of this, it has evolved to be patient: so patient, in fact, that it will not budge unless it is 100% positive that it is the correct thing to do. This acts as a direct message to us, reminding us to contemplate our movements just as carefully and precisely. When our timing is off, we may generate an unnecessary (and unpleasant) struggle or blow an opportunity entirely. Through stillness, awareness, and balance, we can hear and recognize the perfect moment. We must listen to the voice that speaks to us with openness, not fear. If we have patience, the right moment will come, and we will succeed. Man is a unity of body and spirit which makes him utterly distinct from the rest of creation. “Man is not merely an evolution but rather a revolution,” muses G.K. Chesterton. Technically speaking, however, the moonrise for the September 2017 and October 2017 full Moons are very close this year. For several days after both full Moons, the Moon rises a shorter-than-usual time after sunset, creating more light during harvest time. During both months, the Moon will hang large after sunset, casting its beautiful light on our fields of grain. Today is the 10th anniversary of Pope Benedict’s remarkable, generous and important motu proprio Summorum Pontificum, which liberalized the traditional Mass and introduced a new generation to the Church’s treasury of sacred music and liturgy. There is an old saying, lex orandi, lex credendi, lex vivendi, which essentially means how you pray leads to what you believe and then ultimately how you live. Love is the highest frequency & the most powerful force in the universe. Love transcends time & space. Love really is all that matters! Find that thing that is not passing. The Feast of the Epiphany on Lights brings you “Fire” Created By Sophia Ann Elizabeth. Enjoy! On the 12th Day of Christmas my True Love gave to me, Twelve drummers drumming stands for Twelve articles of the Apostles’ Creed.